Ouvertüre Nr. 12 D-Dur op. 145 "Fürstenberger"
L'interpretation des ces partitions inèdites au disque... est exemplaire. Mené avec talent par Johannes Moesus, l'orchestre de Hambourg est vivant, brilllant, précis. Their (Moesus and his Hamburg compatriots) Kalliwoda release is stylish, lucid and tightly focused, with a strong artistic personality that is characterized by Moesus's feel for the music, its energy, and impetus. Rare repertoire well performed deserves admiration. Johannes Moesus, Spezialist für ausgefallene Sinfonik, leitet sachlich-souverän. A peach of an album, memorably conducted, executed and recorded. Johannes Moesus liefert mit dem Kurpfälzischen Kammerorchester höchst engagierte und doch elegante Deutungen ab, klar in der Diktion, schlank im Ton. Viele reizvolle Details werden hier ohne jede Pedanterie hörbar. Johannes Moesus and his band prove they are more than equal to the task, both in the concertos and the symphonies, exhibiting model musicianship and many other qualities indigenous to many of the orchestra's better-known competitors... This is an exceptional release, holding extraordinary music that is presented with enviable and commanding feel for the repertoire. 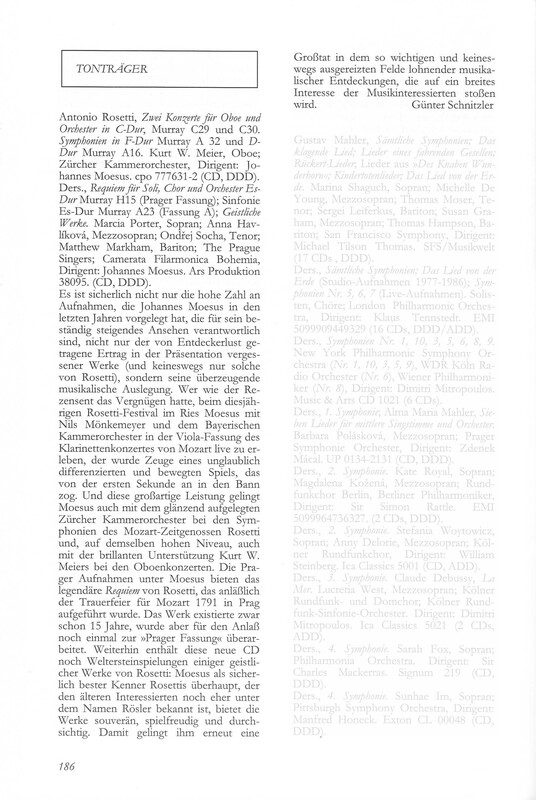 Johannes Moesus's disc offers four works new to the catalogue, with the bonus of his extremely informative insert note. These wonderfully recorded performances are splendidly alive, with an exceptionally fine soloist. 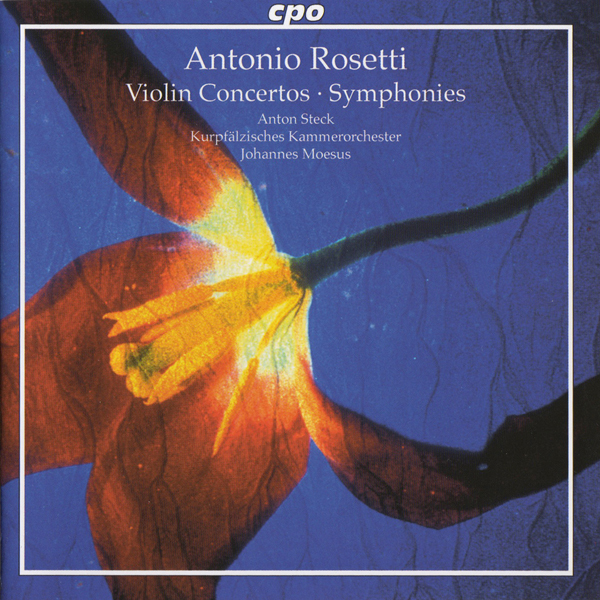 Sous la direction précise de Johannes Moesus, le Kurpfälzisches Kammerorchester restitue à merveille la délicatesse, la légèreté, voire la naiveté des Symphonies d'Antonio Rosetti. Incidentally, if anyone says to you that classical music is boring, just play them the first movement of the B flat Symphony because it is the sort of fun that brightens cloudy days and drives away rain. 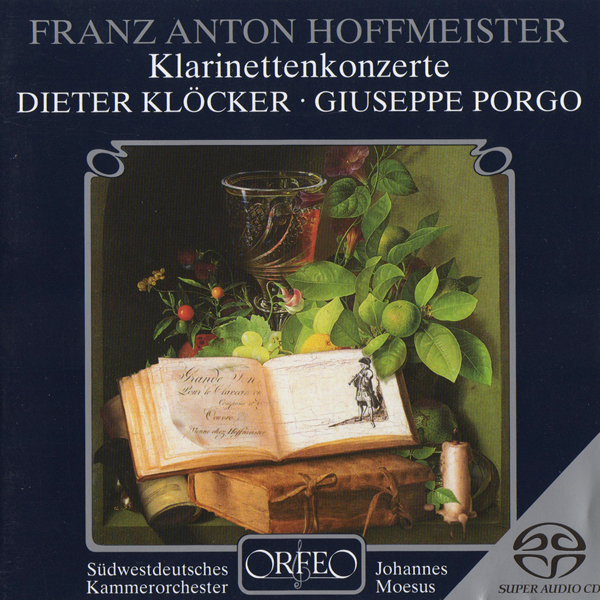 Klöcker und sein Schüler Giuseppe Porgo inszenieren diese Pretiosen mit viel Liebe zum Detail, musikalischem Temperament, makelloser Technik und herrlich dunkel timbrierter Tongebung, wirkungsvoll unterstützt vom famosen Südwestdeutschen Kammerorchester Pforzheim unter der souveränen Stabführung von Johannes Moesus. Johannes Moesus ist mit dem Südwestdeutschen Kammerorchester ein aufmerksamer Partner und mitgestaltender Dirigent. 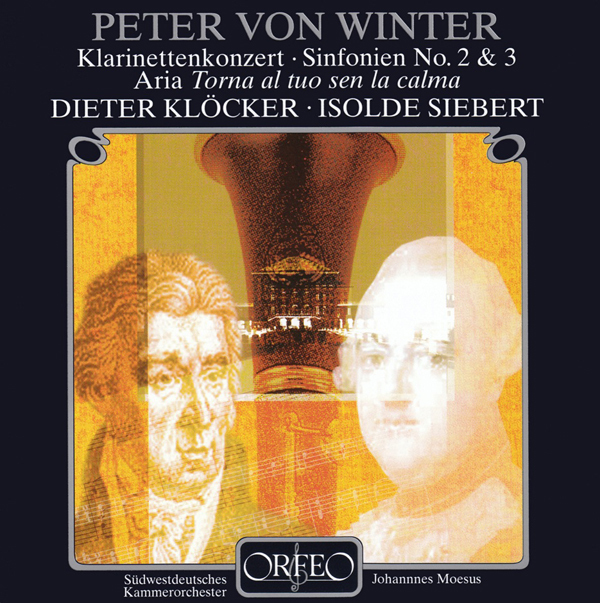 Sinfonie Nr. 6 a-Moll "Türkische"
...This disc leaves you wanting more, and no praise can be higher than that. ... Too bad the cover doesn't say "Volume One", but we can hope! ... 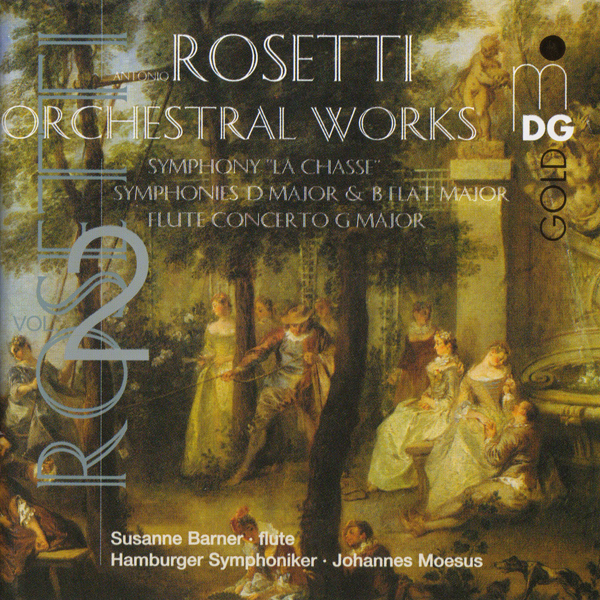 Under Johannes Moesus the Hamburg Symphony plays with imagination and persuasive colour, and they bring these seldom-heard works to life with real panache. ... Johannes Moesus führt die Hamburger Symphoniker zu einer musikalischen Höchstleistung, und die Musiker begeistern sowohl durch ein temperamentvolles wie auch federndes und wendiges Spiel... Keine Einschränkung, deshalb von uns die Höchstbewertung (Supersonic). La presentación de estas partituras magnificas e inspiradas no sólo contribuye al..., sino tambien a la consagración de este joven director alemán como uno de los mejores intérpretes de los últimos anos. Impeccabile, per stile ed intenti, il risultato musicale. ... stylishly conducted by Johannes Moesus. Das Kaiserslauterner SWR-Orchester begleitet unter der souveränen Stabführung von Johannes Moesus mit lebhafter Spontaneität und bestechender Transparenz. Alles in allem eine Produktion der Extraklasse, Aufnahmetechnik inbegriffen. ... finely produced, researched and recorded... Enthusiastically recommended. Johannes Moesus riveting performances draw a splendid response from the orchestra... 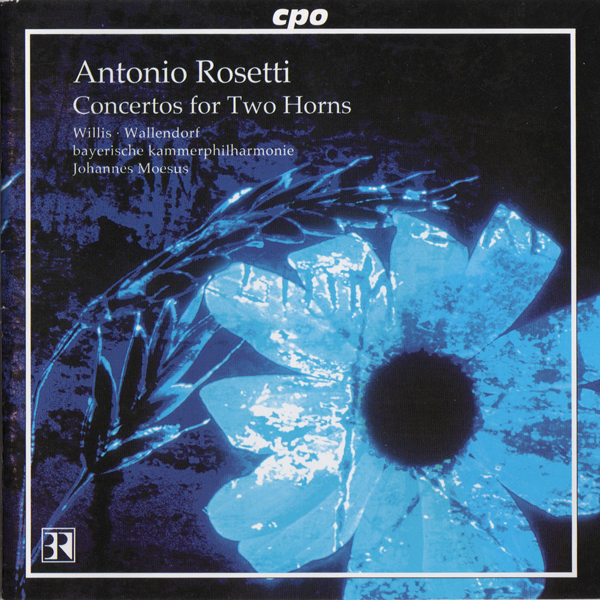 He does wonders with the ostinato accompaniment. Both hornists are members of the Berlin Philharmonic, and they play this technically difficult music with aplomb, teamwork and sympathy... 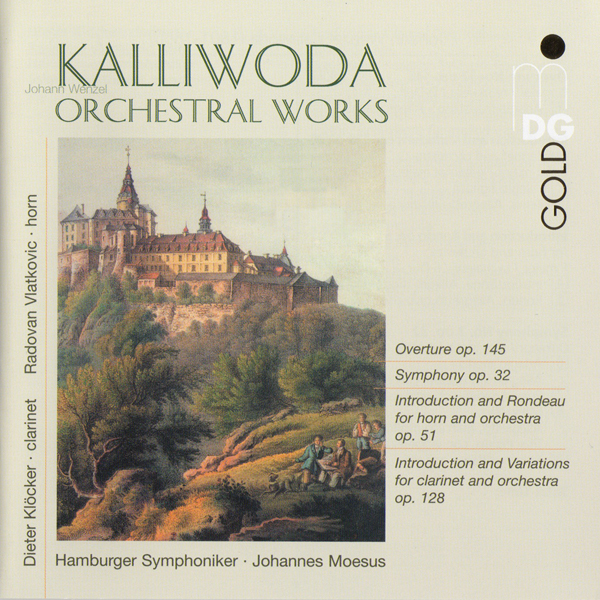 The accompaniments by Moesus and the Bavarian Chamber Philharmonic are lively and well nourished. Nice sound too, thanks to Bavarian Radio. 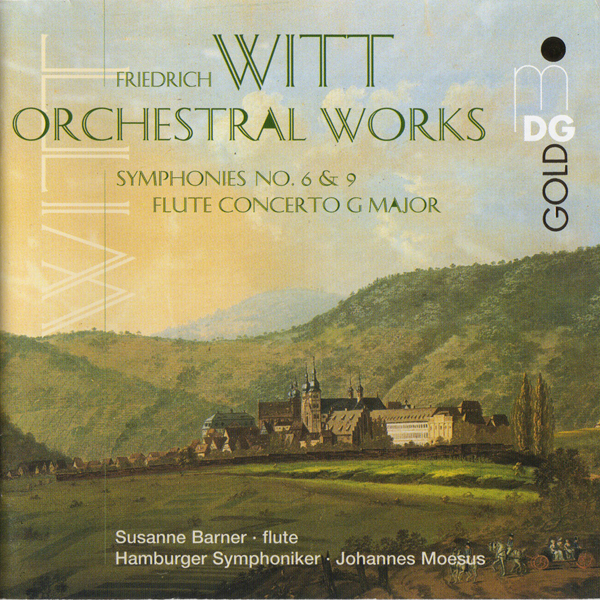 Johannes Moesus... keeps the orchestral balance and texture forever changing...This is an undoubtedly joyous recording and is easily recommendable. No listener could be disappointed with this music as engaging as this, performed as well as this is. 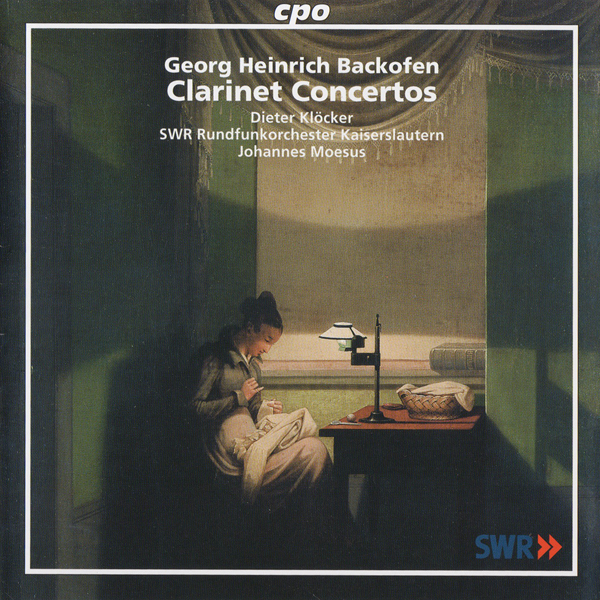 Höchstbewertung für "Performance" and "Sound"
The Hamburger Symphoniker is an excellent band that, when led by Johannes Moesus, displays depth of understanding, confidence, flexibility, and solidity of tone.